Projects are more successful when all the participants – project managers, builders, and clients – find ways to understand and learn from one another. But, that’s not easy. Why is that? Don’t we want to understand and support one another? We probably do. But, our different perspectives can get in the way. Most people on a project are looking for different things when they look at the project. The project manager is looking to define and manage objectives, scope, schedule, budget, and risks. The other people on the project are looking at what they will be creating or what they will have when the project is completed. They see what interests them. And, they see what they are directed to look for. Science backs up my assertion. Listening to NPR earlier in the week, I heard a story about the invisible gorilla. It wasn’t about the 900 pound gorilla that comes to most of our project meetings that we all see but don’t talk about. (Or, maybe it was…). It was about a gorilla in plain sight that we don’t see because we are looking for something else. The study (find it at NPR) was from a Harvard researcher watching how radiologists study scans to find anomalies that would be invisible to the rest of us. Radiologists combine expertise and intense focus to find cancers and defects. Their work can save lives. The study didn’t dispute that. What it was looking for was how that intense focus may cause obvious things to be missed. The researcher put a small picture of a gorilla in the scan and asked the radiologists to find evidence of cancer. 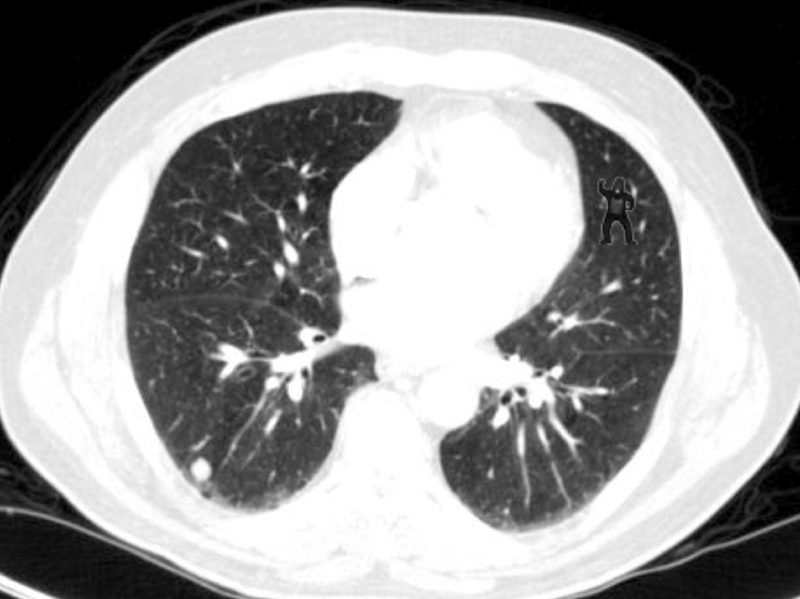 After a thorough look, the radiologists were asked if they saw a gorilla. 83% didn’t. Do you see the gorilla in the picture? The NPR article links to preceding research on selective attention that provides other examples. Go to the “Invisible Gorilla Study” link in the NPR article to see some fun videos on this. Do our challenging projects cause us to focus so narrowly that we block out opportunities? My ideas about finding what can go right on your project and about looking for opportunities by seeking perfect outcomes and a perfect journey may be supported by this study. The Invisible Gorilla Study may point out that, as expert project managers, we can be blind to opportunities seen by team members who have other interests and skills. On your projects, do you ever think: “This is so hard! Why can’t these people be more like project managers?” Maybe these thoughts cause us to overlook the gorillas we need to be successful. If it was up to you (builders, clients) to make this happen, how would you approach it? What benefits – organizational and personal – do each of us want to get from the project? What can make us more open to our blind spots or things we know that we aren’t talking about? What can we do to create stronger commitment and accountability for what we have to do? What opportunities to make us more successful aren’t we taking advantage of? What are the strengths of our group and our organization that we can build on to get where we need to go? What issues are we not discussing that need to be cleared up for us to be successful? What can we do to leave our organization and its people better off in ways that go beyond the project as we do the work of this project? Project management expertise is a wonderful thing. It’s just not the only thing. We also need the wisdom to know that there are gorillas we can’t see that others can. Together we are more likely to find what can go right on our projects. Photo credit www.npr.org and Trafton Drew and Jeremy Wolfe. This entry was posted in Uncategorized and tagged Balance, Benefits Realization, Collaboration, Engagement, Finding What Can Go Right, Perfection, Program Management, Project Management, Risk Management, The Journey by Glenn Briskin. Bookmark the permalink.